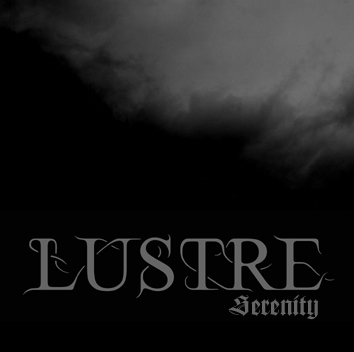 Lustre is a Swedish atmospheric black metal project I've been meaning to check out for awhile, but I never really got around to it until now. I'm sitting here listening to this EP, entitled "Serenity", for a second time, and it's really not that difficult to comprehend. This is not a new sound in the black metal realm and certainly has been done by countless bands in the past as well as in the present. There are only two songs here to delve into, and they are 13 and a half minutes and 7 and a half minutes long, respectively. The first song "The Light of Eternity" is the lengthy one, with its droning wall of guitars in the background overshadowed by somber, minimalistic keyboard lines. These keys are the focal point of this EP. Repetition is a huge element in this music. These songs do not change much. They focus on one or two ideas and drag them out for the duration of the song, and through this EP's 20 minutes, we are only given a few musical ideas to examine. This is not a bad thing and is a staple in this style of black metal. At the same time, however, this sounds extremely similar to many other bands and does nothing to differentiate itself. "Waves of the Worn" is fairly similar to the first track but differs greatly at the same time. We do not hear that melancholic, melodic wall of guitar noise in the background. Instead, it is a purely ambient track only containing keyboards and no vocals. While both of these songs are beautiful, this has to be the better of the two in terms of ambiance. This EP is actually fairly solid for Lustre's starting point, but really is nothing special and we have all heard this before in some way or another. I will be diving into the rest of his stuff, though. This EP has certainly aroused my curiosity.